Picture your ideal holiday. For some it may be an adventurous trek through treacherous mountains, others may prefer to cycle or drive down some of the finest roads in Europe. Many, however, flock in droves to the pristine beaches and amply stock cabana bars of the exclusive luxury islands that epitomize the traditional idea of paradise. Nestled between the tropics, Dead Island’s idyllic setting, Banoi, is exactly what the holidaymaker seeking sun, sea, sand and other trappings could possibly want. Except for the zombies of course. Dead Island combines a surprisingly wide range of features made popular from some of the most successful recent franchises in an attempt to provide something as expansive as Fallout, tense as Left 4 Dead, visceral as Condemned and creative as Dead Rising. To many gamers, however, this combination is like catnip – truly irresistible. Unfortunately, the numerous technical issues that marred the game on release tempered my excitement. While I missed out on the debacle that was the unfinished developer code leaking out through Steam to pre-order customers, my copy still suffered from nearly all of the problems that were being discussed in angry tones on message boards across the web. Prior to some gut-wrenching system file editing, my speakers were at risk of blowing thanks to the persistent static pops and crackles whenever a character spoke, my session crashed to the desktop as often as it booted fully and my mouse sensitivity had a mind of its own, forcing endless reboots. There were many words for the time I was having but none of them were “fun”. I’ll say now that if you are considering paying the full price for a PC copy of Dead Island, it would be wise to wait for developers Techland to release a patch that prevents everything I’ve described. 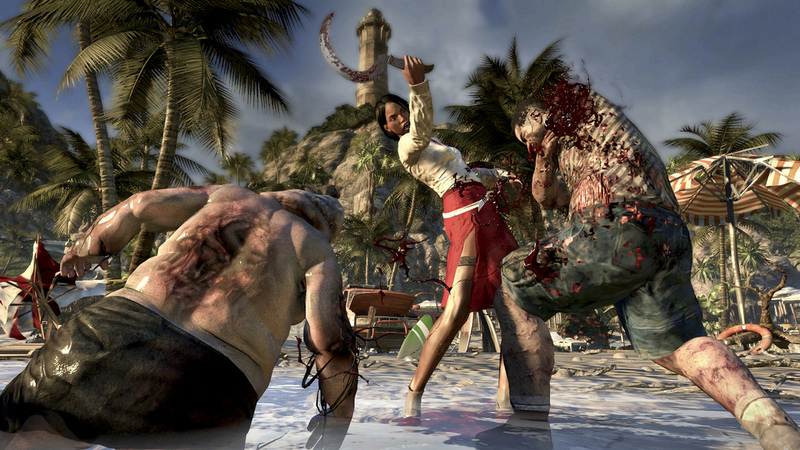 Once everything settled down and I was able to actually play the game, Dead Island impressed me from the very start. Banoi is a gorgeous environment and a perfect counterpoint to the horrific scenes unfolding on its crystal clear shoreline. It’s rare to find a game with a lighting engine that conveys the intensity of the sun beating down without resorting to excessive bloom but Techland have managed it. With draw distances that can be measured in miles and breathtaking vistas to fill the space, it often all too tempting to slow down and just gaze out from on high. Probably not a good idea though because, well… zombies. The undead are on fine form, showing off some of the most grotesque examples yet. While the horror of uncovering a shambling corpse all but concealed by darkness is lost, there’s something unnerving about seeing a bikini-clad corpse sprint towards you in stark, broad daylight. Survivors are equally well realised and, although they don’t quite occupy the same uncanny valley as, say, the cast of Hard Rain, the result is certainly close enough to contribute to the atmosphere rather than distracting you with awkward animations and character models. Complementing the lush visuals is the fantastic sound design. While Dead Island has its fair share of dodgy accents, atmospheric sounds are brilliant with very little music as you explore the vast open world. Wander into a clearing filled with undead and you know something’s up before you see any signs of a thread. Birdsong suddenly drops off and the stillness is only broken by the wind and the vague, worrying sound of a creature shuffling towards you. Or feasting on a nearby corpse. All of this is merely the wrapping on the fascinating package of tried and tested archetypes from some of the survival horror and action RPG greats. 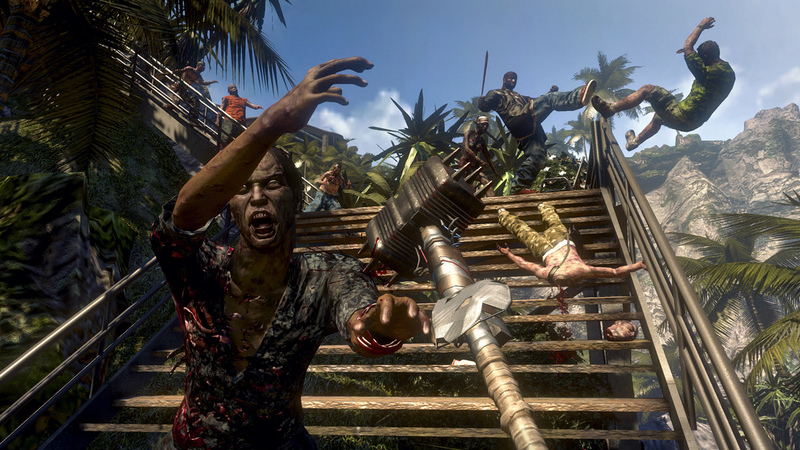 While there are guns and throwing weapons, Dead Island is a first-person brawler at its core and there is nothing more satisfying than taking a swing at a zombie using a lead pipe, fire axe or canoe paddle. With fully modelled skeletal systems, a well placed blow to the arm or leg will render the limb useless. It can lead to some surprisingly comical moments as your (literally) disarmed foe tries to stumble forward and gnash at you, their only offensive option left. Weapon crafting and maintenance, as all items degrade with use, is an essential part of the game and, while some of the combos may not be as far-fetched as the best that Dead Rising had to offer, thanks to a solid upgrade system, they’re all viable and useful additions to your arsenal. Each of the four characters has a specialty class, be it blunt force, edged weapons (my favourite because, let’s be honest, who doesn’t want to use a sword? ), hand-held projectiles or guns (which you don’t find in abundance until quite far into the game) but you can wield whatever you find from the start. Once you’re kitted out, the aim of the game is simple – survive. You do this by the usual route of completing quests, helping NPCs, levelling up and earning money, which is essential to carry on improving items in your inventory. Missions are varied with a clearly defined difficulty scale and you’re free to complete them in whatever order you see fit. There’s little here that stands out as new but there are still few experiences that are more tense than desperately loading your truck with fuel cans while trying to fend off the endless horde. The whole experience is made even more satisfying by the highly effective and enjoyable co-op system. 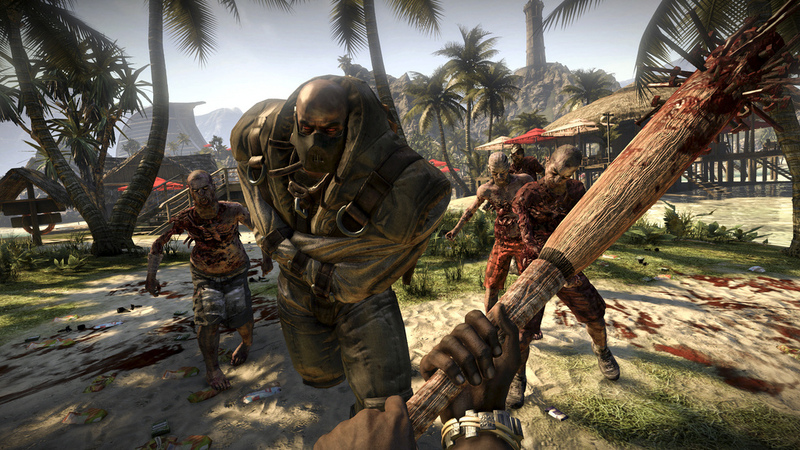 Dead Island supports up to four players at once and, if you don’t have enough friends to tear around with, you can also jump in to other people’s games. The system built around this is elegant and well balanced. You can only ask to join games of players who are close to you in terms of both location and level, so the experience is uniform across all players’ accounts and the existing progression need not be disturbed. Thanks to this, it’s definitely worth trying multiple playthroughs with each character, as you’ll always be able to find a crew with which to cause havoc. Dead Island is a brave and largely successful attempt to bring together some of the most popular features of zombie fans’ best-loved games. The PC version is suffering from some teething problems and controls aren’t spot on just yet, feeling too floaty and disconnected compared to some of the more slick experiences available, but it still comes highly recommended. Once these issues are ironed out, it’ll be easy to recommend to anyone seeking a new kind of adventure. With a great multiplayer component and expansions coming on a reasonably regular schedule, Dead Island is sure to provide long-lasting appeal.